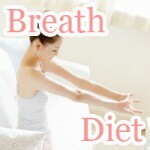 The long breath diet is newest fad since spot reduction that helped Japanese opera singer lose over 60 pounds. I don't know about you but to me that is more than a few stones. 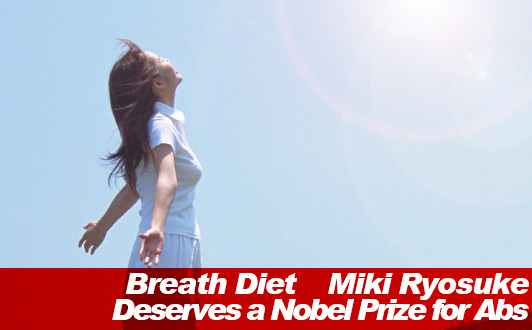 Ever since people from the daily got their hands on the latest breath diet fad in Japan word spread fast about breathing weight loss also known far and wide as Miki Ryosuke Long Breath Diet, there have been some doubts. Does concentrating on breathing technique actually work? - Yes, if you believe in spot reduction. No, if you think that breathing 2 minutes a day is going to help you lose belly fat without exercise. "Anyone who develops a ways to lose weight by breathing deserves a Nobel prize" said Japanese opera singer (53) who is rumored to have also been one the morning banana diet before taking on the long breath diet challenge. Kumiko lost 28.6kg and 31cm off her waist during the 8 month period she spent on the long breath diet. That's over 60 pounds and a foot in waist size. At least that's watch to press release said. In her personal blog she had doubts to say the least. Following the increasing popularity of Miki Ryosuke (55) known for his chiseled abs and the long breath diet (method to lose weight inhaling for 3 seconds and exhaling hard for 7 seconds) selling over 2 million copies of the Miki Ryosuke Long Breath Diet, Kumiko mad here appearance on live TV in to what it would seem as the Japanese version of the Biggest Loser receiving personal training from Miki himself. Under the guidance of Miki Ryosuke, she was directed to take regular walk, do abdominal exercises, and watch her calorie intake in addition to carrying out the long breath diet. Almost 30kg later reducing her weight from a thundering 108.2 kilograms, she noticed changes all throughout her body including her face and was happy with the results she got. Miki Ryosuke was surprised with the results himself. After all, walking and doing situps really paid off in Kumiko's long breath diet challenge. When push comes to shove, you are better off doing more than breathing exercises to lose weight than place all your faith solely a single routine. In the same way that dieting requires balance so does fitness. Here's how Kumiko actually lost weight on the long breath diet that serves as a helpful reference for taking on the routine yourself. Cutting back on carbohydrate intake not only results in eating fewer calories a day but means less influence from your insulin levels in your diet. The insulin response to carbs from your body is said to trigger the mechanism in which excess energy is stored away in fat. Eating less carbs gives you resistance to this mechanism that is said to results in lower utilization of fat stores. In addition to eating less carbs, another way to the insulin response of your body is to go on a low carbohydrate diet eating low-gi foods such as brown rice, soba noodles, and kiwis. Avoid eating cornflakes, carrots, and honey as they are high on the glycemic index making them more likely to trigger an insulin response. The reason eating late at night makes your fat is partly due to your biological clock otherwise known as your circadian rhythm. As much as you would like to think that eating a healthy midnight snack is going to save your weight, that doesn't change the fact that eating late is a big no-no especially when on a diet. As it gets late, your metabolism slows down helping you to relax. Glucocorticoid levels drop affecting how efficiently food is metabolized into energy you can use. BMAL1, a protein tied to storing away fat increases. What do you think happens when you fall asleep right after eating? Eating after sleeping is not going to win you a biggest loser award. No, it's possible the worst time to pick a meal. On top of not doing anything having your activity level reduce to respirator function like breathing and keeping your body warm, your body is prime for storing energy it can't use into your fat stores. How many people can sit down, lie on the floor, and do 100 situps without losing their appetite? - I don't know about you but for someone who is just breaking through the door, a freshman when it comes to fitness, this turns out to be a daunting task. Doing 100 situps or any other anaerobic exercise only requiring a few minutes isn't going to burn your enough calories to make a big dent in your weight and waist size. However, over time as you physical conditioning improves so does your basal metabolism enabling you to burn more energy sitting around. The benefit of doing anaerobic an exercise such as sit-ups, crunches, and light dumbbell exercise is that it helps you boost your metabolism building lean muscle mass. For ladies not wanting to get ripped, you may not add anaerobic exercise to your routine and just stick to walking. One of the biggest fitness myths is that anaerobic exercise is that it results in unwanted muscle mass. Maybe that's the case in heavy lifted while under supplementation but in our case we are keeping it light, so there should be no reason to worry about losing your feminine curves. Starting with a walking routine taking up daily walks of distances between 2 and 5 miles is a good way to break into fitness. For best results in walking exercise it important that you pay attention to your posture, warm up before exercising, and keep a good pace. After all, normal walking isn't going to cut it. 20 minutes after beginning aerobic exercises such as walking is said to be the time when your body starts to burn the most fat exercising. 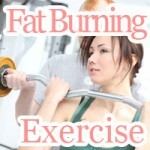 Walking 2 to 5 miles almost ensures that you are going to reach the fat burning zone. If you find yourself spending less to walk 5 miles than 20-30 minutes, walk more. A good rule of thumb for serious walking is to give yourself 30 minutes keeping pace. Exercising with that squeeze ball again? Start squeezing the fat out of your midsection by taking up the long breath diet. No more exercising your arms when what you really want is flat beach ready abs that you can take with you everywhere you go. The fruit cleanse diet plan has it all when it comes to cleansing your body first thing in the morning eating fruit that no cleansing diet should be without.